Prayers and overly-stylized prayer services aside, this is not funny. 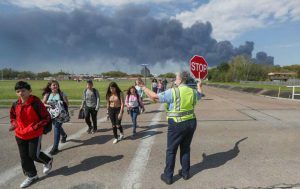 Raging wildfires destroyed more than 1,000 homes in Texas over the weekend and thousands of residents were evacuated from the most-threatened areas. Ten new fires labeled “large” by theTexas Forest Service cropped up Monday night across the state. Drought conditions, high winds, and large amounts of dry, combustible brush are ultimately to blame for some 21,000 wildfires that have hit the state since December. Apparently, Dallas, Houston and SA are all in some extreme fire zone. And housing developments sprawling into wildfire zones does not a sustainable economy make. It doesn’t even do much for a non-on-fire economy. These failings are indicative of many thing, not the least of which is the easy-to-mischaracterize issue of climate change. Easy to demagogue. Easy to childishly refute (It’s freezing in Florida! in February!). But the earth is just as dry and the fires just as hot, as the climate changes and the effects thereof are just as severe and damaging – whether they choose to believe in it or not.